While I was in Japan last year I took to collage as a fast way to get new ideas out and into the world. I’d dabbled a bit with this approach, earlier in 2016, combining simple collages and watercolours in a concertina book. The latest manifestation, an ‘altered’ book, has come into existence during the masterclass I participated in last week. I think it was apt when someone commented that my book was not so much ‘altered’ as ‘interfered with’. I didn’t realise how coming back home from my art residency only a few weeks before Christmas would impact on my work flow. At the time there was a real lag in my energy levels, not surprising given that day to day life and concerns were back in my face again. With the new year comes the need to get moving on making new work. I aim to pick up some of those ideas that came, as always, in the final days of my residency. 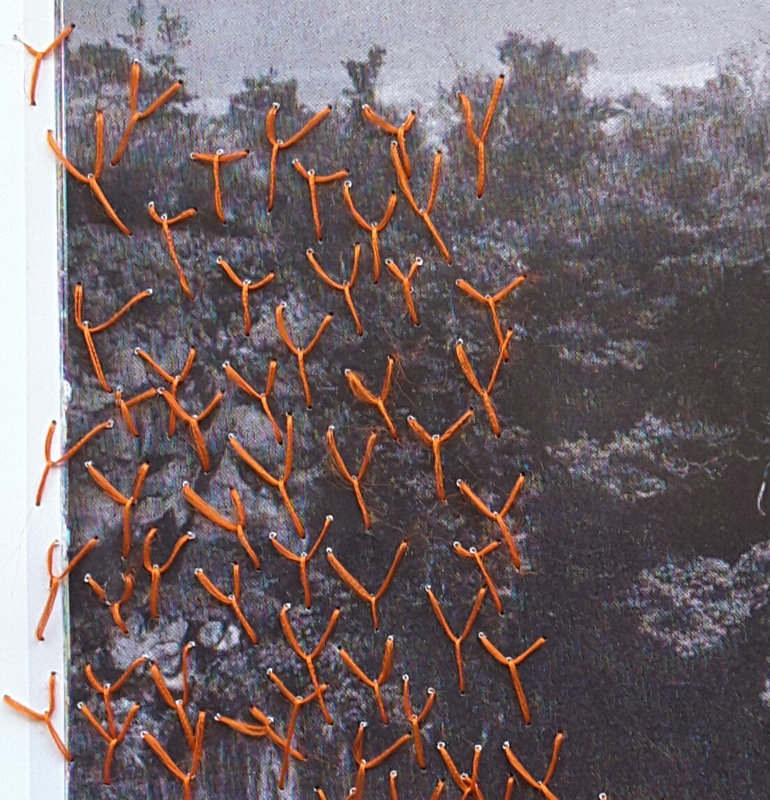 In particular I am working on having a more direct interaction between the photographs I have taken, or have found in old books and my stitching. 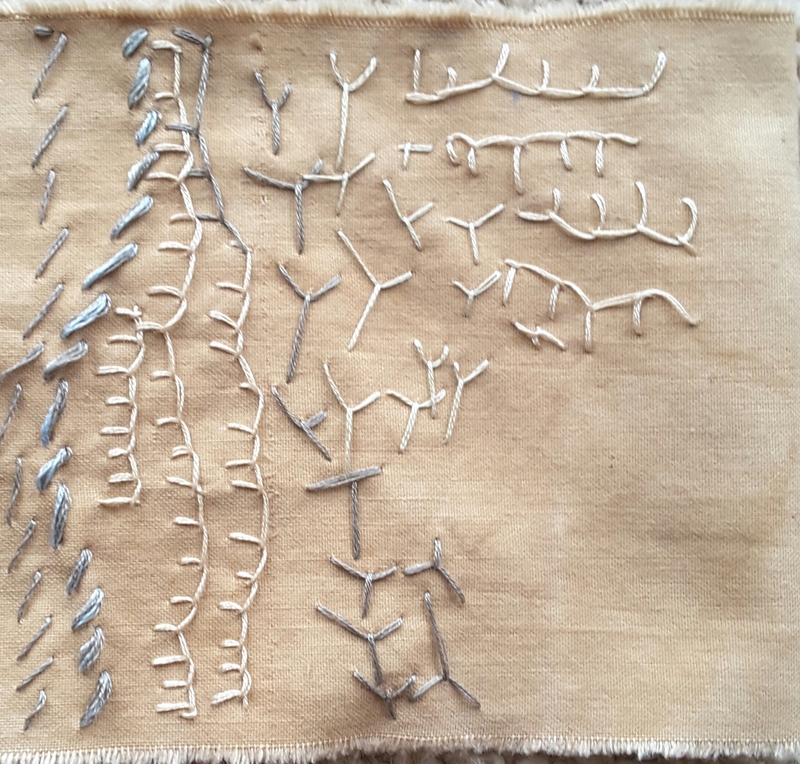 This process has been assisted by another activity I am currently participating in, the 365 day handstitch challenge (on Facebook and Instagram), where participants undertake to stitch one thread every day of 2017. I’ve chosen to work with fabric and thread that I took to Japan, but didn’t use. To make sure that my work stays loose I’m working with a favourite technique ‘stitching with my eyes closed‘. As you can see the challenge is having an impact on my other work. Today the Urban Sketchers Canberra group met for its first outing of 2017 at the Mt Stromlo Observatory. I wasn’t sure how many people would come along as the forecast was for 34°C, thankfully it didn’t get that hot while we were there and we had a breeze for a fair part of the morning. While we were gathering I spotted my first choice for sketching. This fire hydrant is a rather folorn reminder of the devastating firestorm that swept across Mt Stromlo and down into the suburbs of Canberra in 2003. As the morning hotted up and the ants started biting I decided to retreat to another location. 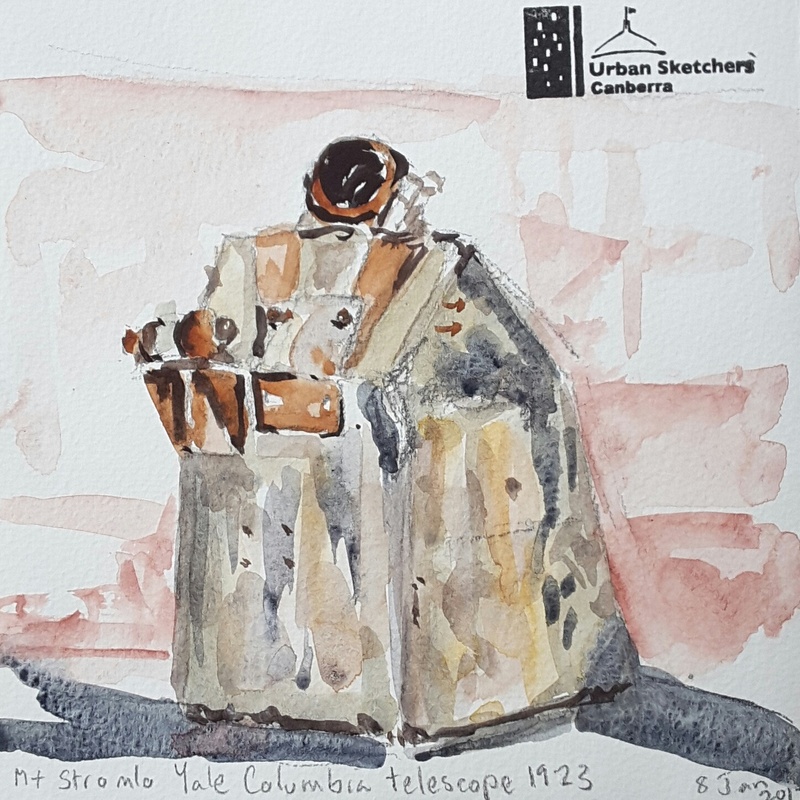 I joined one of our other sketchers in the cool shade of the remains of the Yale Columbia telescope (built in 1923). The ruined mounts for the telescope now make for very dramatic sculptures inside the shell of the building. The other mount reminded me somewhat of a Dalek, must be that squat shape. We were happy to retreat inside to the cafe for our sketchbook ‘throw down’ and compare notes after several hours of sketching. You can see more sketches from this morning on the USk Canberra Facebook page and on this blog by fellow sketcher Michelle. My previous visit to the observatory can be found here.